Our girls who train with the LMWPL Advanced Program, playing as the “Thundergoats” at the recent Spooktacular Tournament in Victoria, BC. 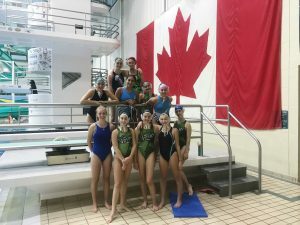 The new vision for the Advanced Program this year, and moving forward, is to provide an opportunity for recreational athletes, currently playing for their respective community clubs, to engage in more challenging training and high quality water polo experiences in both gender-specific and co-ed contexts. The program will be a place where LMWPL athletes can continue to build on their personal strengths, address their areas of weakness, engage with a variety of coaching styles, participate in informal and formal scrimmages with players from teams outside of their home club (again both gender specific and co-ed games), and further develop their passion for water polo, all with long-term athlete development in mind. As part of this new vision, the Advanced Program’s goal is to provide opportunities for girls from community teams across the Lower Mainland to engage in higher level gender-specific training, while continuing to play for their community clubs. This program will act as a bridge between recreational, community and high performance clubs by offering training focused on skill development, game knowledge, and strategy. It also aims to foster community among participants, with the anticipation that the female athletes will take their new skills and confidence back to their own clubs, where they can be leaders on their teams, encouraging more girls to participate in the sport but also inspire younger girls (i.e. U10 and U12) to pursue water polo at higher levels. In addition to increasing the opportunities for female athletes to play as a group at the community level, the girls will also develop leadership skills that they can take back into their community co-ed teams. These skills will strengthen the teams overall and help to build a culture where all athletes work together, regardless of gender.